GALLIPOLIS — St. Louis Catholic Church on Fourth Avenue will be undergoing serious building renovations starting next week. Recent work in the building discovered that much of the electrical wiring and systems not only failed to meet code, but also presented a danger. An inspection to install insulation in the roof showed that an outdated wire type was still in use, and if insulation were installed it would likely cause a fire. The structure was originally built in 1908 and has gone largely unchanged since then, according to Priest Thomas Hamm. The only changes to the infrastructure was remodelling on the basement level and the wiring there during the 1980’s, and it is also now outdated. On Monday workers will begin the long process of rewiring the entire building, from new distribution panels to outlets throughout the building and new LED lighting inside the church and on the exterior. Several exterior lights will also be installed on the front of the church and in the parking lot as well to help improve safety. Other items being installed are programmable lighting in the sanctuary of the church as well as motion activated lights in the bathrooms and foyer to help reduce the cost of lighting. LED lights will also contribute to a smaller electric bill, according to Hamm. Funding the project will rely heavily on the public. The total cost of the project is near $420,000, 200,000 of which has already been raised. $150,000 was borrowed to start the project with $70,000 coming from existing funds with the church. Funding for this project has been provided through regular giving by members, several fundraisers over the past few years, and a pledge drive. The next fundraiser is this coming Saturday August 26 from 4-8 p.m. in the Parish Center. Adults pay $10 to get in, children pay $5. A raffle, silent auction, and 50/50 split the pot will also be going on to help raise funds. Take out will be available as well as spaghetti sauce by the quart for $8. The work is expected to take about three months, and the power will not be turned back on until the facility passes state inspection. Masses will continue to occur in the Parish Center until the work is complete, with church functions continuing as usual, explained Hamm. 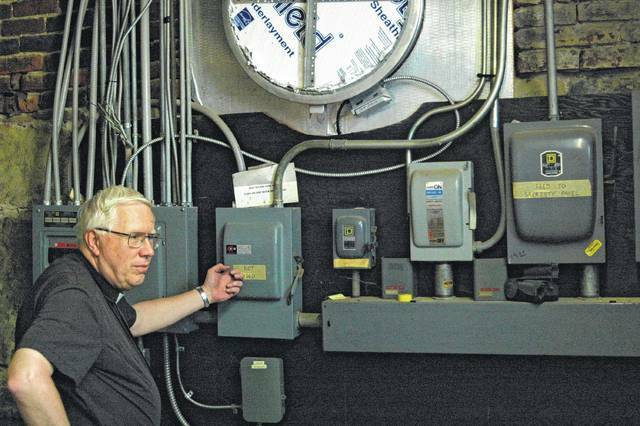 Father Thomas Hamm explains the necessity of upgrading the distribution panels to ones that are safe and meet current codes. The exhaust over the panels will also be removed and sealed up. The church is looking at three months of work.